New Delhi: Listening to them telling their own stories – the trials and triumphs, victories and vulnerabilities that they face in everyday life – is going to take the centre stage at The Constitution Club Auditorium in Delhi, as about 45 children in the age-group of 10-18 years from different areas in and around the city assemble to participate in a theatre festival. Christened as ‘Suraksha Hamara Haq’ and organised by CRY – Child Rights and You and its partner Alliance for People’s Rights (APR), the event is a platform where they will raise their voices on issues that affect them the most – their rights to protection, education, education and participation. The performances will be followed by a panel discussion where children will present experiences of bringing about lasting change in their own lives and in the communities they live in. The panel in turn will suggest concrete suggestions and way forward towards mitigation of the challenges faced by children. 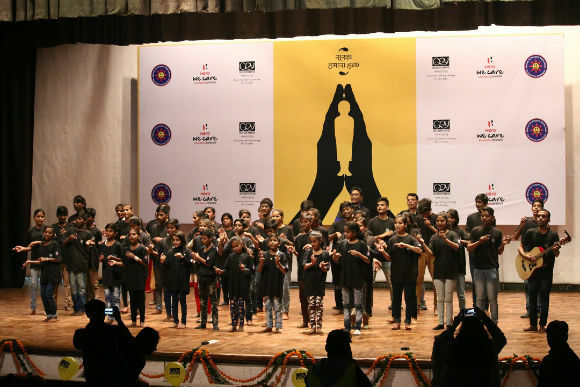 Plays highlighting the issues of child safety and protection become all the more relevant and appropriately timed, as the recently published data shows that Delhi is the Metro City with highest number of cases of crime against children recorded over a period of the past five consecutive years. According to data compiled by the National Crime Records Bureau (NCRB), the city registered 7392 cases of crime against children in 2016. Despite the fact that the figure is less than that of the previous year (8035, in 2015), it is still way ahead of Mumbai, the city recording 3400 cases, the second largest number of crimes reported against children. This means, simply put, Delhi proved to be the worst in terms of safety and security of growing children among other cities across the country. “Ensuring protection of children is the responsibility of the society as well as the state which, being the prime duty bearer, cannot abdicate its role in providing safety and security to children and young adults. Ensuring protection for children must therefore be the topmost priority for every school, other concerned stakeholders and the government as well”, Ms Moitra added. Mentored by Walter Peter, an eminent theatre personality with an NSD (National School of Drama) background, children from various collectives run by organizations partnering CRY will perform in three short plays which will highlight issues such as child sexual abuse and child protection in schools, along with safety of children in and outside school premises. “The plays are products of a rigorous three day long workshop, where the plots and the storylines have evolved through sharing of experiences by children, thus making the process essentially a collective, creative pursuit with interactive participation, explained Walter Peter. While one of the skits, ‘Sabko Batana Hai’, will talk about the ordeal of children who are punished and abused in the name of implementing discipline in schools and undergo phases of deep psychological trauma; another production called ‘Nazar Badal Lo Apni’ will depict their daily experiences of being stalked and eve teased while walking from home to school and back. We want them to raise their voice and ask people at large to create a conducive environment so that children can live a happy, healthy and creative childhood,” said Reena Banerjee, Convener, Alliance for People’s Rights. The event will culminate in collating and compiling panelists’ suggestions and presenting the same to the audience. Later on, a Charter of Demand will be made based on the suggestions by the panelists, and would be handed over to the relevant stakeholders. The Charter will call for providing a safe, secure and protective environment for children that is free from abuse, violence and exploitation in schools.